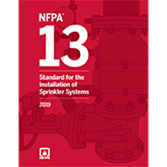 Interested in the 2016 NFPA 13 edition? Find it here. 4.5 System Protection Area Limitations. 4.8 Air, Nitrogen, or Other Approved Gas. 4.9 Support of Nonsprinkler System Components. 4.10 Noncombustible Materials and Limited-Combustible Materials. 6.3 Connection of Pipe, Fittings, and Appurtenances. 7.3 Aboveground Pipe and Tube. 7.5 Joining of Pipe and Fittings. 8.3 Preaction Systems and Deluge Systems. 8.4 Combined Dry Pipe and Preaction Systems for Piers, Terminals, and Wharves. 8.7 Outside Sprinklers for Protection Against Exposure Fires (Exposure Protection Sprinkler Systems). 8.9 Commercial-Type Cooking Equipment and Ventilation. 9.2 Allowable Sprinkler Omission Locations. 9.5 Position, Location, Spacing, and Use of Sprinklers. 10.2 Standard Pendent and Upright Spray Sprinklers. 10.3 Sidewall Standard Spray Sprinklers. 11.2 Extended Coverage Upright and Pendent Spray Sprinklers. 11.3 Extended Coverage Sidewall Spray Sprinklers. 14.2 Early Suppression Fast-Response Sprinklers. 16.5 Protection of Risers Subject to Mechanical Damage. 16.6 Provision for Flushing Systems. 16.16 Electrical Bonding and Grounding. 17.4 Installation of Pipe Hangers. 18.1 Protection of Piping Against Damage Where Subject to Earthquakes. 18.6 Restraint of Branch Lines. 18.7 Hangers and Fasteners Subject to Earthquakes. 18.8 Pipe Stands Subject to Earthquakes. 19.3 Occupancy Hazard Fire Control Approach for Spray Sprinklers. 20.6 Building Construction and Storage: Heights and Clearance. 20.7 Unsprinklered Combustible Concealed Spaces. 20.10 Adjacent Hazards or Design Methods. 20.12 Hose Stream Allowance and Water Supply Duration. 20.14 Protection of Idle Pallets. 20.15 Column Protection: Rack Storage and Rubber Tire Storage. 21.2 Control Mode Density/Area Sprinkler Protection Criteria for Palletized, Solid-Piled, Bin Box, Shelf, or Back-to-Back Shelf Storage of Class I Through Class IV Commodities. 21.3 Control Mode Density/Area Sprinkler Protection Criteria for Palletized, Solid-Piled, Bin Box, Shelf, or Back-to-Back Shelf Storage of Plastic and Rubber Commodities. 21.4 Control Mode Density/Area Sprinkler Protection Criteria for Rack Storage of Class I Through Class IV Commodities. 21.5 Control Mode Density/Area Sprinkler Protection Criteria for Single-, Double-, and Multiple-Row Racks for Group A Plastic Commodities Stored Up to and Including 25 ft (7.6 m) in Height. 21.6 Control Mode Density/Area Sprinkler Protection Criteria for Rack Storage Rubber Tires. 21.7 Control Mode Density/Area Sprinkler Protection Criteria for Roll Paper Storage. 21.8 Special Design for Rack Storage of Class I Through Class IV Commodities and Group A Plastics Stored Up to and Including 25 ft (7.6 m) in Height. 21.9 Sprinkler Design Criteria for Storage and Display of Class I Through Class IV Commodities, Cartoned Nonexpanded Group A Plastics and Nonexpanded Exposed Group A Plastics in Retail Stores. 21.10 Control Mode Density/Area Sprinkler Protection Criteria for Baled Cotton Storage. 21.11 Control Mode Density/Area Sprinkler Protection Criteria for Carton Records Storage with Catwalk Access. 21.12 Control Mode Density/Area Sprinkler Protection Criteria for Compact Storage of Commodities Consisting of Paper Files, Magazines, Books, and Similar Documents in Folders and Miscellaneous Supplies with No More Than 5 Percent Plastics Up to 8 ft (2.4 m) High. 22.2 Palletized and Solid-Piled Storage of Class I Through Class IV Commodities. 22.3 Palletized and Solid-Piled Storage of Nonexpanded and Expanded Group A Plastic Commodities. 22.4 Single-, Double-, and Multiple-Row Rack Storage for Class I Through Class IV Commodities. 22.5 Single-, Double-, and Multiple-Row Racks of Group A Plastic Commodities. 23.3 Early Suppression Fast-Response (ESFR) Sprinklers for Palletized or Solid-Piled Storage of Class I Through Class IV Commodities. 23.4 Early Suppression Fast-Response (ESFR) Sprinklers for Palletized or Solid-Piled Storage of Group A Plastic Commodities. 23.5 Early Suppression Fast-Response (ESFR) Sprinklers for Rack Storage of Class I Through Class IV Commodities. 23.6 Early Suppression Fast-Response (ESFR) Sprinklers for Rack Storage of Group A Plastic Commodities. 23.7 Protection of Exposed Expanded Group A Plastics. 23.8 ESFR Protection of Rack Storage of Rubber Tires. 23.9 Early Suppression Fast-Response (ESFR) Sprinklers for Protection of Roll Paper Storage. 23.10 Plastic Motor Vehicle Components. 23.11 Sprinkler Design Criteria for Storage and Display of Class I Through Class IV Commodities, Cartoned Nonexpanded Group A Plastics and Nonexpanded Exposed Group A Plastics in Retail Stores. 23.12 Protection of High Bay Records Storage. 24.2 Sprinkler Design Criteria for Palletized and Solid-Piled, Storage of Class I Through Class IV and Plastic Commodities. 24.3 Sprinkler Protection Criteria for Open-Frame Rack Storage of Class I Through Class IV and Plastic Commodities. 24.4 Hose Stream Allowance and Water Supply Duration. 25.1 General Requirements of In-Rack Sprinklers. 25.2 Ceiling-Level Sprinkler Design Criteria in Combination with In-Rack Sprinklers. 25.4 Vertical Spacing and Location of In-Rack Sprinklers. 25.5 Horizontal Location and Spacing of In-Rack Sprinklers. 25.6 Protection of Racks with Solid Shelves. 25.7 Horizontal Barriers in Combination with In-Rack Sprinklers. 25.8 Alternative In-Rack Sprinkler Protection Options That Are Independent of the Ceiling Sprinkler Design. 25.9 In-Rack Sprinkler Arrangements in Combination with CMDA Sprinklers at Ceiling Level. 25.10 In-Rack Sprinkler Arrangements in Combination with CMSA Sprinklers at Ceiling Level. 25.11 In-Rack Sprinkler Arrangements in Combination with ESFR Sprinklers at Ceiling Level. 25.12 Design Criteria for In-Rack Sprinklers in Combination with Ceiling-Level Sprinklers. 26.2 Flammable and Combustible Liquids. 26.4 Spray Application Using Flammable or Combustible Materials. 26.6 Installation and Use of Stationary Combustion Engines and Gas Turbines. 26.9 Oxygen-Fuel Gas Systems for Welding, Cutting, and Allied Processes. 26.10 Acetylene Cylinder Charging Plants. 26.11 Compressed Gases and Cryogenic Fluids Code. 26.13 Production, Storage, and Handling of Liquefied Natural Gas (LNG). 26.14 Protection of Information Technology Equipment. 26.15 Standard on Incinerators, and Waste and Linen Handling Systems and Equipment. 26.16 Standard for Ovens and Furnaces. 26.17 Health Care Facilities Code, Class A Hyperbaric Chambers. 26.18 Fixed Guideway Transit and Passenger Rail Systems. 26.19 Motion Picture and Television Production Studio Soundstages, Approved Production Facilities, and Production Locations. 26.22 Standard for the Construction and Fire Protection of Marine Terminals, Piers, and Wharves. 26.25 Airport Terminal Buildings, Fueling Ramp Drainage, and Loading Walkways. 26.26 Aircraft Engine Test Facilities. 26.27 Advanced Light Water Reactor Electric Generating Plants. 26.28 Light Water Nuclear Power Plants. 26.31 Fire Protection of Telecommunication Facilities. 26.32 Exhaust Systems for Air Conveying of Vapors, Gases, Mists, and Noncombustible Particulate Solids. 26.35 Metal/Nonmetal Mining and Metal Mineral Processing Facilities. 28.1 Approval of Sprinkler Systems and Private Fire Service Mains. 28.3 Automated Inspection and Testing Devices and Equipment. 28.5 Hydraulic Design Information Sign (Hydraulic Data Nameplate). 29.4 Revamping of Pipe Schedule Systems. 29.5 Revamping of Hydraulic Design Systems. 30.2 System Components, Hardware, and Use. 30.9 System Instructions and Maintenance.